In the mid-1990s, Meany Center (then known as the UW World Series) gained an invaluable new community partner for our K-12 outreach: The Ladies Musical Club. Over the past two decades, LMC ‘s Music in the Schools program has been instrumental in helping us to bring hundreds of artists on our Series into public schools for lectures, demonstrations and residencies. LMC has a lot of practice bringing music to the community. The Club was established in 1891, making it the oldest musical institution in Seattle. Its founders comprised 22 women musicians whose mission was to foster an appreciation of classical music in a frontier town that was just beginning to discover its cultural and civic identity. LMC also broke ground by providing unique performance opportunities for its members at a time when few women were able to pursue careers as professional musicians. Additionally, LMC played an essential entrepreneurial role in Seattle’s musical life, sponsoring performances by world-renowned musicians from 1900 to 1995. Just a few of the international stars the Club introduced to Seattle as part of their concert series include Sergei Rachmaninoff, Fritz Kreisler, Jascha Heifetz, Marian Anderson, Pablo Casals, Kirsten Flagstad, Arthur Rubinstein, Vladimir Horowitz, Joshua Bell and Emmanuel Ax among many, many others. 126 years later, the Ladies Musical Club is still presenting public concerts (about 50 a year). In addition, its mission has broadened to include augmenting music programs in a broad spectrum of Seattle public elementary schools, focusing on those that have minimal music programming or professional staff. The LMC also holds a yearly competition for emerging professional musicians that results in both financial support and an opportunity to tour communities across the state for education and outreach activities. Here at Meany Center, we see the impact of the Ladies Musical Club every year. In the 2016-17 Season, for example, we presented both the Calidore String Quartet and the African American step dance company, Step Afrika! 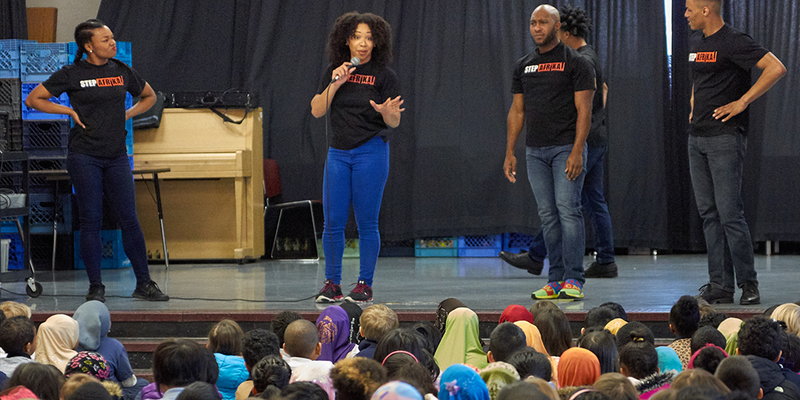 to LMC-participating schools for in-school performances that reached hundreds of children. On several occasions, professional ensembles such as the Marian Anderson Quartet and the Young Eight have held extended residencies that culminated in a community concert featuring the student and professional musicians performing together. Prior seasons have seen Meany Center artists such as the Miro Quartet, The Nile Project, SO Percussion, Martha Redbone, Daedalus String Quartet and many others performing in school classrooms, cafeterias and gyms for audiences that are just as enthusiastic—and sometimes more so!—as the ones at Meany Hall. LMC also helps spread the word about student matinees at Meany Hall—and often assists in providing transportation to these events. They say it takes a village to raise a child. In collaboration with LMC, Meany Center is helping to raise thousands. We are more grateful than we can say for the generations of women in the Ladies Musical Club who embraced that ideal long before the phrase was coined.